This article was originally published at Tekla Warehouse. Concrete contractors face unique challenges when estimating, planning, and managing their formwork operations. In addition to needing an accurate and understandable design, inadequate planning can result in costly delays that affect the entire project. And, knowing when and where equipment is needed is essential. Trimble and Avontus have partnered to help concrete contractors with these challenges. Enhancing Trimble’s commitment to improving operational efficiency, Trimble has partnered with Avontus, driving a more streamlined and productive way for concrete contractors and formwork providers to estimate, plan and manage their formwork operations. The equipment information in detailed formwork models created with the Tekla Structures is now integrated into Quantify, Avontus’ inventory management software. Joining Tekla Structures with Quantify takes the industry to an entirely new level. Formwork modeling and detailing is now integrated into a fully-featured equipment management suite. 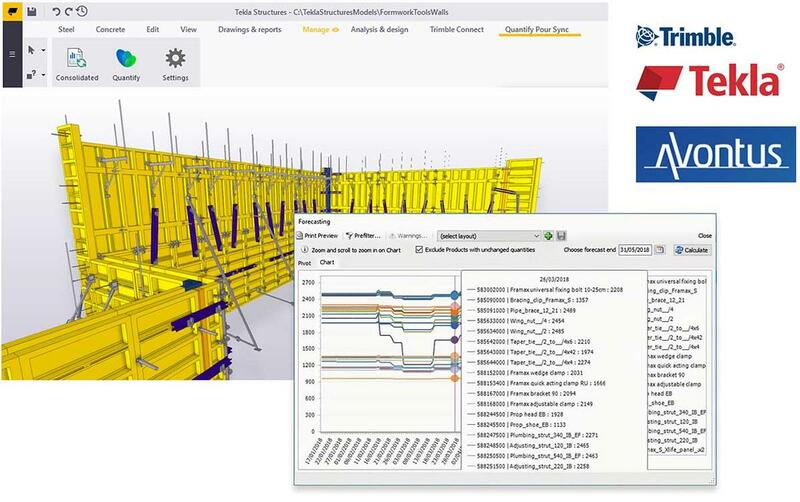 “Whether a small concrete contractor or a large multi-national formwork provider, the combination of Tekla Structures and Avontus Quantify allows those planning and managing formwork to solve bigger problems. This new integration between our software will vastly improve their operations.” Dickey says. Avontus’ has been producing quality software since 2002, focused exclusively on the formwork, shoring, and scaffolding industries. Their easily-operated and thoroughly tested software is the most technically advanced in the industry. Affordable software to manage your scaffold, formwork, or industrial services company. Introducing cloud and pay-as-you-go pricing options for all Avontus software products. On-premise or in the cloud, it’s your choice. With a small startup cost and a minimal monthly fee, you can have the best software available for scaffolding, formwork and industrial services companies. You can start with a budget-friendly cloud-hosted or pay-as-you-go solution, and as your company grows, you can quickly convert to on-premises, if needed. The exact same feature-rich version of Quantify is available in the cloud. Quantify was built from day 1 to evolve with the ever-changing needs of scaffolding, formwork, and industrial services companies. Quantify Cloud offers a low-cost, server-free solution without any per-user charges. This includes our fully-featured API, which allows your developers to tie our logic and data into your custom back-office solutions. With a single monthly fee, all of your customers and employees can do exactly what they need to do, all with no IT involvement. If you are on a budget or have a temporary need for design software, you can purchase a Pay-As-You-Go license. Pay-As-You-Go also has a minimal startup cost and a small monthly fee. Pay-As-You-Go is installed on your desktop, laptop, or tablet, and is easily activated and de-activated. As with our on-premises offering, full implementation, data conversion, and customized training is included in your purchase of Quantify Cloud and Pay-As-You-Go products. Cloud and Pay-As-You-Go customers receive the same highly-responsive and professional support as our on-premises customers. Software updates are automatic and require no IT assistance. The cost of all updates is included in the subscription fee. Whenever our software is updated, web-based training specific to new features is provided at no additional cost for subscribers worldwide. View the training schedule. If you’re thinking about upgrading to Windows 8, we want you to know that Quantify has been accepted into the Windows Store. In order for an application to be accepted into the Windows Store, Microsoft must first rigorously test it, to ensure compliance with Windows 8. We’re pleased to be the first and only software application in the scaffolding industry that meets their stringent requirements. The latest Quantify product guide is available online. The guide provides an overview of features, as well as details on specific Quantify functions. Find out all the ways Quantify can make your business life easier.